Their rivalry was as intense as it was renowned, but it took until What Ever Happened to Baby Jane? in 1962 for the conflict between Hollywood stars Bette Davis and Joan Crawford to break out into the open. "Sure, she stole some of my big scenes, but the funny thing is, when I see the movie again, she stole them because she looks like a parody of herself and I still looked like something of a star," Crawford famously said on the film's release. 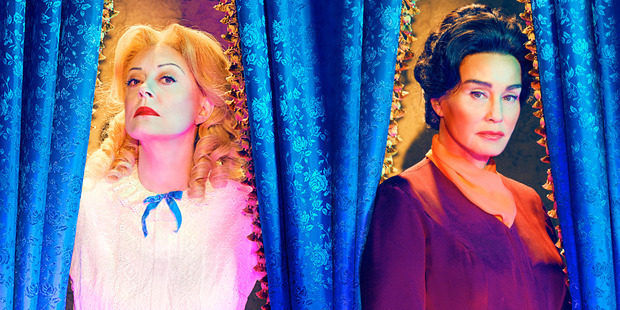 The complexity of their relationship is now at the heart of Feud: Bette and Joan, coming to Soho this week. Starring Jessica Lange as Crawford and Susan Sarandon as Davis, it tells a story of sexism, ageism and survival - themes that still echo across the industry. Last week, as controversy about the paucity of film industry jobs for women on and off camera began to gain traction ahead of the Academy Awards, Lange and Sarandon reflected on the fact that the well-documented bias women face in film has barely lifted. "Not that much has changed," Lange, star of The Postman Always Rings Twice and the recipient of dozens of awards, said last week. "We're still living in a sexist, misogynist, ageist time - the last gasp of a patriarchy that they're not going to give up easily. So women suffer; we see it in the landscape of the past year. It could not be more evident." Crawford and Davis made What Ever Happened to Baby Jane? when they were barely in their 50s but were already considered by studio bosses to be at the end of their careers. But both women were keen to work. During an interview on US television, Davis told the story that Warner Bros boss Jack Warner had initially refused "to put up one nickel for us two old broads". The next morning she received a telegram: "Dear Miss Davis, please do not continue to refer to me as an old broad. Sincerely, Joan Crawford." Though the feud between Crawford and Davis was exaggerated by the studios for publicity, it was nonetheless a product of male dominance, says Catherine Zeta-Jones, who plays Olivia de Havilland, the actress who ultimately left Hollywood for Paris. "Feuds come down to pain and fear. There was a hierarchy. The bigwigs - the white guys - would pick and choose the lead roles. So it was a competition, and these women were grasping to hold on." Or as another actress of the era, Joan Blondell, said at the time: "Women when cornered do what they always do: eat their own and then pick their teeth with the bones." Susan Sarandon and Jessica Lange as Bette Davis and Joan Crawford. As a young reporter, director Ryan Murphy sought an audience with Davis that was not granted until the last month of her life. She greeted him in a pillbox hat, enveloped in a cloud of cigarette smoke. She asked him if he'd like to hold her Oscars. "I said, yes, I would," recalled Murphy, and Davis talked freely for four hours. "She talked about her pain and her regret and what it was like to be a woman and be told you were done when you felt you were only just getting started." For Lange, who like many believes Crawford was unfairly maligned by her adopted daughter Christina's scathing memoir, Mommie Dearest, the main issue for female actors remains a lack of roles. She recalls that at the start of her career there seemed to be plenty to go around. "Then because of age, or whatever, there's a steep drop-off and you think, f***, I haven't had an interesting part offered to me in a very long time. What happened? It's a kind of a shattering experience to realise you're no longer wanted." The huge disparity inspired Murphy to set up the Half Foundation, which aims to offer entertainment industry jobs, mentorships and scholarships to women, people of colour and members of the LGBT community. The foundation comes by way of a late apology, perhaps, for the way Crawford and Davis were treated by the business in their later years. "I wanted to explore what a tragedy the last 15 years of their lives were," says Murphy. "If we could meet the real Joan and the real Bette, I would say to them, 'I'm really sorry'. These women had so much to offer and love to give, and they weren't allowed to express it." "Joan and I have never been warm friends. We are not simpatico. I admire her, and yet I feel uncomfortable with her. To me, she is personification of the movie star. I have always felt her greatest performance is Crawford being Crawford." "I wouldn't piss on Joan Crawford if she were on fire." "A feud? Oh, no. I couldn't ever be bothered with anything like that. Let's just say Joan's not someone I would have any cause to see socially. Or ever did." "She has slept with every male star at MGM except Lassie." "Bette will play anything, so long as she thinks someone is watching." "Miss Davis was always partial to covering up her face in motion pictures. She called it art. Others might call it camouflage - a cover-up for the absence of real beauty." "With all her little gestures with the cigarette, the clipped speech, the big eyes, the deadpan - I was just as much an actress as she was, even though I wasn't trained for the stage." Michael Buble and Luisana Lopilato welcome third child! QUIZ: Which Meryl Streep character are you?